If you are the owner of a mobile food business of any size, you surely recognize the need of lead generation in keeping your business healthy and financially sound. But, it may be that you lack the tools to consistently develop a new stream of potential customers. The good news is that this article was written just for you. You have to generate new leads, but how? Here are some ways to generate quality leads for your food truck business, so that you can turn those leads into happy customers. Step one is not to prejudge your lead gathering techniques. Though you may think you are not going to get great results, or you are overly confident about the success, you cannot be sure. The only way to know if your lead generation is working is to put it into action without preconceived ideas about results. When you understand the specific group that most needs the products or services you offer, you will be able to reach them more efficiently. For example, if you are trying to reach elderly customers, you have a better chance of generating leads if you avoid a skateboard shop. Use social media as a lead generation tool. In social media, you need to not only build a presence, you also need to build a community. It’s an opportunity to build trust which will lead to more and more customers coming your way. Don’t just look at the obvious social media channels. Consider them all. Next, look into pay per click campaigns to generate leads. The first place most people go to seek business opportunity is Google. If you aren’t on page 1 organically for the typical search terms they use, then you need to pay to be there. You only are charged if people click the ads, so it’s an excellent way to simply build local brand awareness as well. 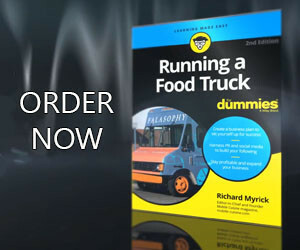 Ask your current customers to pass on word about your food truck to those they know. Your current loyal customers are the best lead generation asset you have. Their word of mouth can really mean a lot to generating new customers. Just them sharing your company information in social media can be surprisingly powerful. Reward your current loyal customers for providing you customer leads. One way that many companies do this is by offering their current customers referral rewards. These rewards run from future discounts to actual cash back. This can be a lot cheaper in the long run than any form of traditional advertising. See if you can join or sponsor local events in any way. Maybe you can buy uniforms for a Little League team, or park your truck at a church garage sale. If so, be sure to show up at the event yourself so you can shake hands and get face time with potential leads. Check out local events in order to maximize your leads. If you’re allowed to operate there, you could hand out catering pamphlets and hold a giveaway. Just ask people to leave their name and email in return for a ballot, but be sure to let them know if you’ll be adding them to a mailing list. Consider teaching a class on the skills you have. For example, if your food truck is known for Mexican food, teach a basic Mexican cuisine class. You can let students know about whatever it is you’re doing and you can look for those students you think would make the best leads and then target them directly. Don’t forget about having a follow-up plan. Once you have generated some leads, it is important to remember that you need to turn those leads into paying customers. Have a plan in place so that you can begin that work as soon as you get some quality leads. Look at your competitors (food trucks and restaurants) to see what tactics they use to generate leads. You don’t need to reinvent the wheel when you are starting up. Oftentimes, your competitors have already done the hard work for you. If you see them using certain tactics heavily, there’s a good chance they are doing so because it works. Talk to business owners in related industries. They may be willing to share leads with you, by sending their customers your way. For example, if you own a food truck where you sell healthy menu items, talking to a gym owner about a joint venture is a great way to get leads from another business. Deal with opt-out and privacy issues. Don’t spam people who don’t want your offers. It’s a waste to communicate with those not likely to buy. And you’ve got to be careful about communication with anyone who did not opt in. There are privacy laws around it. In order to maintain the health and longevity of a business, lead generation is a topic that must receive significant attention. Utilize these suggestions when developing your own lead generation strategies. Failing to consider the future is a recipe for business failure every time. With any luck, reviewing the ideas we provide will serve help equip you to face the coming months and years with confidence.